A podcast to encourage and uplift moms on the journey of motherhood. 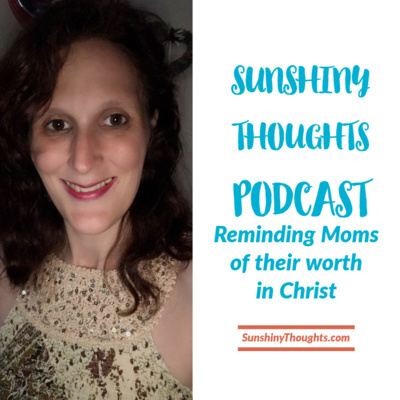 Sunshiny Thoughts podcast was started as a ministry to encourage and inspire moms. Motherhood is a tough job. The guests from Sunshiny Thoughts are people who we believe will build you up and help you in your faith. Sunshiny Thoughts is based on the truth from the Word of God. The show is desired to inspire moms and remind them of who they are in Christ. It is also a reminder that you can do all things through Christ who strengthens you. Sunshiny Thoughts has been on a brief hiatus due to a lot of changes - all for the better. Today we are back on the air with a great show from my friend and I Am Enough in Christ Women's Conference Keynote Speaker - Jenn Baxter. Jenn is an author and speaker. You can learn more about Jenn by visiting liveafastlife.com. If you would like information on the upcoming I Am Enough in Christ Women's Conferences visit http://iamenoughinchrist.com Thanks for tuning in and join us next week as I will be back with my my friend author, coach, speaker, and brand new book hitting stores soon Elizabeth Clamon. You won't want to miss it. If you would like to learn more about sunshinythoughts visit sunshinythoughts.com Have a blessed day!